Discover what WordPress is and what it does… choose between hosted WordPress.com and self-hosting… reliably install and upgrade WordPress… get comfortable with the Dashboard… create pages and posts… work efficiently with content. Find, download, and install the best WordPress plug-ins, including the incredible Jetpack toolset… Akismet for stamping out comment spam… Zemanta's supercharged content production tools… easy tools for creating maps, impressing search engines, and more! Instantly create or revamp your site's look-and-feel… discover, choose, and modify the perfect visual theme… create great magazine-style sites with Magazino… or simple, elegant photography sites with AutoFocus. Quickly build professional navigation with menus… organize top-level pages… create attractive sidebars… add powerful content features with widgets (including default, plug-in, and theme-based widgets). Safely allow and control contributions from many users… identify new site authors… set profiles and establish roles to define what everyone can and can't do… control discussion settings to create the best possible community. Use tags and categories to attract users and search engines… share content to Facebook, Twitter, and other networks… use your WordPress site as a newsletter… use RSS to automatically forward your content to subscribers… improve site performance with Jetpack stats and Google Analytics! Build Amazing WordPress Sites Now: Just Watch! 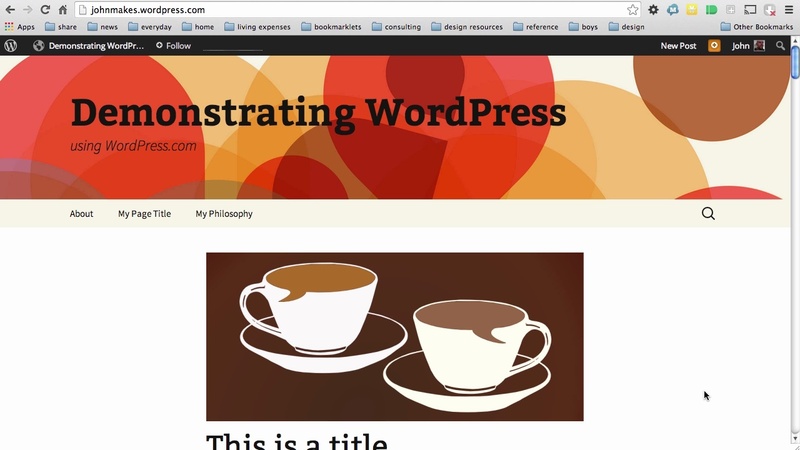 Create great websites with WordPress–painlessly! WordPress for Beginners puts all the stunning power of WordPress at your command… even if you've never used WordPress, never built or run a site, never even created a web page! In 5 hours of brilliantly crafted video, top instructor John LeMasney gets you 100% comfortable, productive, effective–just watch! You'll learn how to use hosted services or install WordPress on your own computer… master WordPress's powerhouse tools… use themes to instantly get pro-quality look-and-feel… organize content and add media… invite contributors, organize forums, and manage users… add slick features with free or cheap plug-ins… keep your site secure. Then, go even further: integrate your site with Facebook, Twitter, and RSS subscription feeds… even attract more visitors with proven SEO techniques and advanced Google Analytics. WordPress can do it all: that's why WordPress skills are in huge demand. With these videos, those skills are yours, in just 5 hours. It's all hands-on, up-to-date, and (above all) easy! 6 modular lessons, organized for instant access & fast mastery! Lesson 1.1 What is WordPress?